To adjust the height, hold two adjacent shaft sections one in each hand. To unlock: grip then twist your right hand towards you, then extend or compress the tubes to suit. Do not extend passed the STOP mark on any section, except to dismantle the shaft. To lock: grip the shaft (not the plastic collar); twist your right hand away from you steadily and firmly (not fast and abruptly) until tight. Use steady firm turns (not quick snappy ones) when tightening any expanding bolt; this allows time for the nylon/plastic of the locking mechanism to engage fully against the inside of the shaft wall. Set bottom shaft at the 'A' mark to keep the pole lightest at this end for an easier pendular action. When adjusting the upper sections use the EVA sleeve for a firmer grip. Before use, lean your weight on the pole to ensure that each shaft section is locked securely (check again when in use particularly if there is a temperature drop). expander is positioned near the top of the threaded bolt, and its flanges are parallel. 2. Align shaft sections end-to-end in a straight line, and insert. 3. 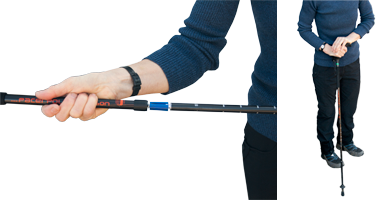 Push to required length, then twist the upper shaft section away from you whilst holding the lower section tight. 4. When the pole is assembled, lean on it to test that the bolts have been tightened enough before use. Remember after use, dismantle the shaft into sections, stow in mesh bag and hang somewhere dry until needed. If you do happen to over-tighten the sections and can't undo them - then either clamp the handle between your feet (back of the handle towards you), hold the shaft section firmly with both hands and twist it hard anticlockwise - or - use a piece of rubber or latex glove (stowed in a pocket) to wrap around the shaft section for a better grip; twist hard! A. If the section twists continuously without locking try stretching-wider the expanding bolt's white upper flanges with fingers - and then re-try. B. A sudden temperature drop has an affect on Alloy and on nylon-plastic (expanding bolt flanges) - as these materials contract at different rates - so check shaft sections …as they may need retightening. Dismantle the shafts into their sections and note the white expanding bolts (Alloy poles) or coloured ones (Carbon poles). As you twist the bolt down the thread, the flanges widen (so they can grip against the inside of the shaft wall). When you twist the bolt up the thread, the flanges flatten - which allows the section to slide inside the other section - so you can adjust the shaft height etc. The tube diameter of the carbon shafts is narrower than that of the Alloys, and their bolt flanges need to expand at the top as well as the bottom as you twist the bolt down the thread (so that a bigger surface area is gripping the shaft wall); this means it will take an extra half twist before both the top and the bottom flanges are fully 'out' so you may feel you are over-tightening. Similarly when twisting to unlock, an extra half twist is needed before both the bottom and the top are flattened enough to slide the section - when wanting to adjust the shaft height (or dismantle after use). Try using steady, firm turns (rather than quick, abrupt ones) when tightening any expanding bolt - this allows time for the nylon-plastic of the locking mechanism to engage fully against the inside of the shaft wall. Until you are familier with judging the amount to turn then you may over-tighten the sections so you can't undo them - suggest using a section cut from a thin rubber glove (or equivalent) or one of the latex gloves which you can stow in your pocket ... then wrap it around the lower shaft section and grip-and-twist the upper section to undo. The 12mm diameter Carbon bottom shaft section is very light and more easily 'blown about' in strong winds. When in these conditions, to increase its weighting adjust the shaft sections so the middle section covers more of the bottom section .... and then extend/increase the top shaft section to personalise the pole height again. Do the same if moving over rough scree or boulder fields to protect the bottom shaft section. Afterwards, remember to re-adjust bottom shaft to the "A" mark, and the middle shaft to your personalised pole height to raise the 'weighting' of the pole for an easier pendular action (see Weight v Effort on FAQ page). Condensation can occur inside any tube and dampness can cause the metal thread of any expander to oxidise as white, rough markings - so they won't perform as they should. To avoid this happening - dismantle any Carbon or Alloy shaft into sections, stow in the mesh bag and hang somewhere dry until needed. Allowing dry air to circulate keeps the poles happy! Do this after use .... or if using everyday - then perhaps overnight when possible. Use plain water to clean the poles as necessary - and allow to dry .... inside and out! DO NOT LUBRICATE inside any shaft section or their expanding bolt (as the poles rely on friction locking). grip whilst twisting the baskets. All baskets should be finally positioned with their top touching the top rim of the plastic tip housing and be able to rotate independently of the shaft; this avoids the shaft twisting and loosening the expanding bolts which can happen if the basket is fixed/stuck between rocks, deep bog or snow and you twist to free it. To retrieve, remember to twist in the direction as if you were tightening the expanders and not undoing them! In snow - putting a smear of grease such as Vaseline at the top part of the tip housing above the threaded section, can help avoid the plastic basket binding to the plastic of the housing, reducing the chance of them becoming frozen together in very low temperatures. The 'street-feet' should be removed when you move off hard surfaces onto a track or open country (and stow in a pocket until needed). If on dry rock - then the 'street-feet' can be used for better contact (but the rock needs to be dry, otherwise they may skid). The rubber 'feet' are used to reduce the 'click-click' noise when the carbide tip hits hard/paved/tarmac surfaces - which can be very anti-social; the rounded shape is not direction-specific and can be used up or down paved slopes. Remove the 'street-feet' though, even if on these hard surfaces - when they are slippery with leaves/snow/ice, so that the exposed carbide tip can bite into the ground for better grip. Here, take smaller steps, to keep the stride length under the pelvis/trunk (consider increasing the rate rather than length of stride, if wanting to increase speed); keep the trunk vertical when you go up a slope (if you lean forward your foot could skid backwards as you pushed against it). Coming down, then lean a fraction forward and keep the knees slightly bent.